While I’m happy to do most of my armory design on a computer, there are times when you need to be able to put together a device or badge submission entirely offline, most notably at Pennsic and other large multi-day events. Some folks have both an encyclopedic knowledge of heraldic art and the freehand illustration skills necessary to produce quality designs unassisted, but many people with less experience or weaker drawing abilities — and those who, like me, have both of those challenges — depend on references like the PicDic and the Pennsic Traceable Art collection. I recently heard about an effort led by Lady Þórý Veðardóttir to update the Pennsic Traceable Art book to clean up some of the rough scans, include additional material, and otherwise upgrade this useful tool, and have thrown myself into the effort. I’m terrible at freehand drawing, but am able to tackle the digital illustration and page layout side of things, so I’ve jumped in and drafted a bunch of printable heraldic elements, scaled so that they’re ready to be traced over (perhaps using a lightbox) to help speed the process of creating devices and badges. I’m pleased to share a rough draft of the first set of illustrations resulting from this work: a set of common field treatments, divisions, and ordinaries, all drawn at the exact scale used for SCA heraldry submissions. None of the material here is particularly complicated or unique, and any experienced herald painter could reproduce most of this in minutes with just a pen and a straightedge, but hopefully this will help make things a little easier and save a bit of time for folks dealing with the crush of hundreds of submissions processed at Pennsic every year. 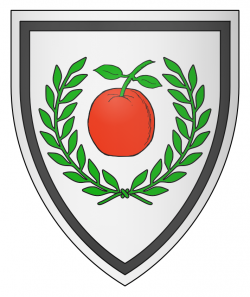 Argent, an apple gules slipped and leaved proper within a laurel wreath vert, and an orle sable. 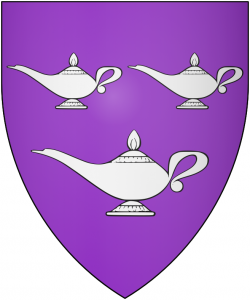 Earlier this year, I worked with other members of the Canton of Whyt Whey, our local SCA branch here in Manhattan, to design a new set of branch arms. We went through innumerable drafts and proposals before settling on a device which gained unanimous consent. As with many medieval devices, these are “canting arms”, featuring the city’s namesake big apple, along with the required laurel wreath and an elegant black stripe. Argent, an apple gules slipped and leaved proper within an orle sable. 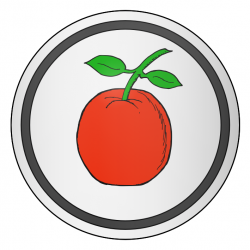 We’ve also submitted a design for a populace badge, which features the same design elements without the branch-marker laurel wreath. Both designs have been submitted and will hopefully be approved and registered next summer. Purpure, three Arabian lamps argent. I worked with a local member of Østgarðr to refine their device design and document their preferred name for submission to the College of Heralds. The construction “given-name descriptive-byname” is found as a period construction for Russian names in the same “Dictionary of Period Russian Names,” which states “there are numerous cases of simply adding a common adjective onto a given name,” and gives “the Unkissed”, “the Unpredictable”, and “the Long-Nosed” as examples. “The Orphan” is a descriptive byname rendered in English under the Lingua Anglica Allowance.